Dealing with the loss of a loved one is not something I ever expected to have to experience, at least not until I was, like, OLD and my parents were ready to move on or something...y'know? And even then, it seemed like it was so far removed from where I was at in my life that I hadn't actually thought seriously about it anyways. So when my sister passed away after a hard battle with cancer, I was reeling for every reason imaginable. She was critically ill for just enough time before she actually passed that I had a little time to seriously consider the likely outcome. I remember thinking with a strange mix of horror and agony, shock and wonder, "Wow. So I'm about to find out what this feels like." Someday, when I'm far enough down The Road of Adjusting to Living With Grief, I'll write a post about dealing with grief yourself...but I'm too close to that, right now, just yet. What I can write about is what you can do to help when someone you love has lost a loved one. We have had SO MANY incredible people helping in ways I didn't even know I needed help in, that I needed to write down what I have learned from their amazing examples of love and service. It should also be noted that we deal with loss is as many different ways as there are people...so these are just 7 things that I, personally, found particularly helpful. ALSO... please don't feel like this is a mandatory list of must-do's either! This is simply a list to refer to if you are desperate to help and need ideas. 1) Reach out. Just do it. Whether there's awkwardness between you, it's been a while, or you think you have nothing to say, just reach out anyways. I was so touched when people I hadn't heard from in forever cared enough to reach out to me with a simple "I'm so sorry to hear" or "thinking about you." Tragedies have a way of making all the distances between hearts disappear. 2) You don't need to make them feel better. This one is tricky to explain out-loud, so bear with me. There is nothing that you can say that will make them feel better right now. Nothing. What they are going through is just 100% crappy and that is it. The end. It is just hard and it hurts, regardless of anythinganythinganything. Reminding them of their beliefs in an after-life, saying someone is in a better place, telling them anything that starts with "at least...", or anything else that is intended to lessen the pain is off-limits. For now, at first. Let them take the lead on seeing whatever silver lining they can, when they're ready...and, even then, maybe just listen and nod. People are so good and caring and kind...and it's only natural to want to cheer someone up! One of the (many!) things that surprised me about experiencing the loss of a loved one was how little I wanted people to make me feel better...like, not at all. When you try, you run the risk of trivializing their pain, and coming across like you're trying to make it not-such-a-big-deal. However, the effort to be kind was always appreciated, on some level...so (as a disclaimer) don't feel so stressed about saying the "right" thing, that you end up saying/doing nothing at all. So maybe you can't make them feel better, but you can validate how they must be feeling right now. Defend and protect their right to be in agony, and let them know that however they're feeling is okay. Do give your condolences, tell them how you can't imagine how hard this must be, let them know you're thinking of them...anything, really, that will let them know that yes, this is awful, and you love them. ...instead of offering the too-general "if there's anything I can do...." (which we are ALL guilty of!) If you really want to help somehow, just do something. Don't necessarily rely on the person grieving to tell you what they need because 1) It's hard to even fathom exactly what you need when everything aches...and 2) When you experience a great loss, ALL of the normal things like eating, showering, parenting are overwhelmingly difficult and exhausting! It's really the little, day-to-day things that help the most. Take them a meal. Mow their lawn. Steal their kids for a couple hours. Bring them a movie you know they'd like. Give them a bath bomb and tea. Send them a gift card for some guilt-free retail therapy...or a restaurant so they don't have to make food themselves. Go clean their bathroom, or send a cleaning service over. Bring them a bag of groceries. Drop a favourite chocolate bar in their mailbox. Anything is something. Send them a note that doesn't necessitate a reply. Stop by with a treat, but don't expect them to visit and chat like usual. Keep sending love out even if it seems there is nothing coming back for a while. Invite them for a walk, for dinner, for hot chocolate...but understand if they decline. And keep inviting them anyways, no pressure. They need the reassurances that they have all the space they need, but they are also not forgotten. Grief and mourning are different, I've learned. Grief is your ailment, mourning is how you deal with it or "let it out." Mourning is essential to learning to live with grief in a healthy way, to healing. 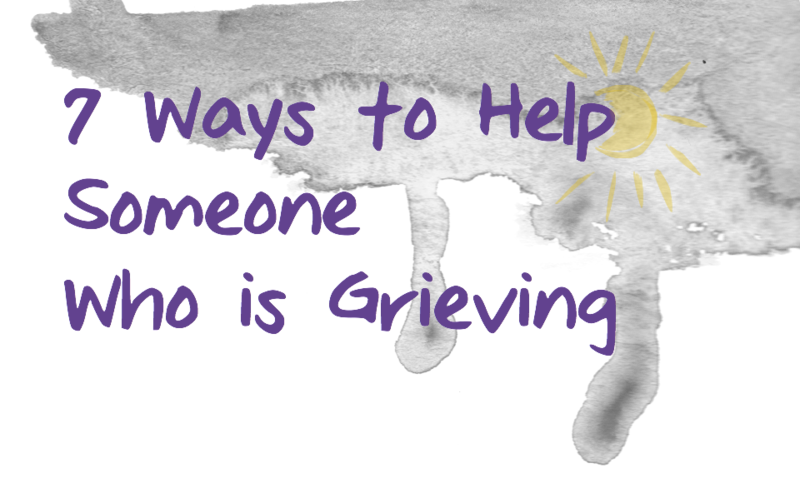 Allow and encourage the person grieving to talk about it, cry about it, just sit with the pain, feel it. Support things like music, writing, creative projects, running, tributes in honour of the person lost, goals made in the wake of new realizations, etc....anything that allows the person to "let it out" in a healthy way and/or acknowledge the person who's loss they are mourning. Grief and mourning are not just emotional burdens; they actually have physiological symptoms as well, like fatigue, short-term memory issues, attention and focus difficulties, etc. Most people are resilient and get through the worst of it okay, but some spiral into longer-term issues like depression and anxiety. Grief never goes away, you just learn how to live with it...and it takes longer for some than others. Let your person have their time. Oh Laura, my heart still goes out to you for your loss. I imagine that this post was somewhat difficult to write but what a blessing to have so many people loving and supporting you through such a a challenging time. These are such wonderful examples and tips. I felt myself nodding along as I recently went through the grieving process as well. It's so hard to know what you, yourself want or need in times of grief. I think I'm ready to share a story about this with you. When I read this post, I pinned it and thought that I really should keep it in mind as I felt I would be needing to refer to it very soon. Less than 5 hours later, I found out my grandma died. I sincerely believe God was working through you and preparing me that day through this post. While I've been in the midst of my own grief, I find comfort in trying to support others in their grief... in particular my dad, who lost his beloved mom. Thank you once again for sharing (and for linking up to the SHINE Blog Hop). Oh, Jennifer! That just filled me up. Thank you so much for sharing that with me. Beautifully said and written. Thank you for writing this. And just know my family continues to keep you and yours in our prayers. Hugs to you! Thank you for the prayers and hugs! Yes, I ditto the above comments. This is very good advice. I tend to fall into the "not wanting to say the wrong thing so I just don't say much at all" category. And I would really like to change that about myself. I especially like the point about not trying to make them feel better. Because you're right, you can't. But you can just be there for them. This was very well said. Thank you for sharing despite your sorrow. Thank you so much for your kind words; I totally tend to fall into the same category so it was eye-opening being on the other side this time. Laura, I'm so sorry for the loss of your sister. Please be patient with yourself as you work your way along that "Road of Adjusting to Living With Grief." It's not an easy journey. Thank you for sharing your experience. Your "7 Ways" post eloquently and concisely speaks to many of the things that helped me (and didn't help) after my husband's death. It offers clear assistance, so I've added a link to your post on my Helpful Resources page on "What to Say When Someone ..." at TealAshes.com. Again, thank you for putting these helps into words. Some aspects of grieving are beyond fitting into the boundaries of language, but you've expressed these seven points well. I'm so grateful you stopped by. It's definitely been something I've had to take day-by-day, some days better than others. Thank you!